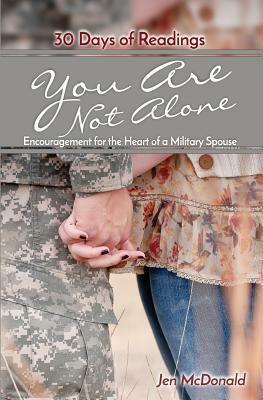 In You Are Not Alone: Encouragement for the Heart of a Military Spouse, Jen offers a helping hand and a whisper of "You've got this " as you make your own way. She celebrates the great moments with you, commiserates when it's not so easy, and points you to hard-won wisdom and helpful resources. Most of all, she reminds you that you're not alone on this military spouse journey. Jen McDonald has been "married to the military" for 25+ years, and is the mother of four, including one son in the military. She and her Air Force husband have been stationed all around the world from Europe to the Pacific and won't count how many houses they've lived in because that would be too depressing. She writes regularly for Military Spouse Magazine and has been published in numerous books and national publications including Good Housekeeping, Redbook, and Family Magazine, as well as online sites such as Crosswalk.com and Focus on the Family's Family Talk Radio. An experienced editor, she currently serves as the Content Editor for MilitaryByOwner Advertising. She loves to connect with and encourage other military spouses, whether it's through her writing or in real life. She regularly writes about military life, parenting, and homeschooling, while her Instagram is full of foodie pics and running selfies, as she believes in hobbies that complement each other. Connect with Jen at jenniferlmcdonald.com.